Lake Delton, which is south of the Village of Delton, will add another 134 residential and 19 premises to the network. The estimated cost of the expansions totals around $770,000; grants will reduce the cost to the RUC by contributing a little more than $443,000 to the projects. Reedsburg also recently received the new Telecommuter Forward! Community Certification. The designation, passed into law in April 2018, recognizes communities in rural areas that have taken steps to improve local connectivity in ways that encourage telecommuting. Communities apply through the Public Service Commission for the designation. The PSC determines if they are eligible by reviewing criteria such as economic development activity, telecommuter friendly work space, coordination with Internet service providers, and other factors that encourage telecommuting. In Reedsburg, where a symmetrical, affordable gig is available to everyone, transforming subscribers from consumers into active participants in the online economy isn't a stretch. Learn more about Reedsburg by listening to our 2015 interview with Brent Schuppner for the Community Broadband Bits podcast. 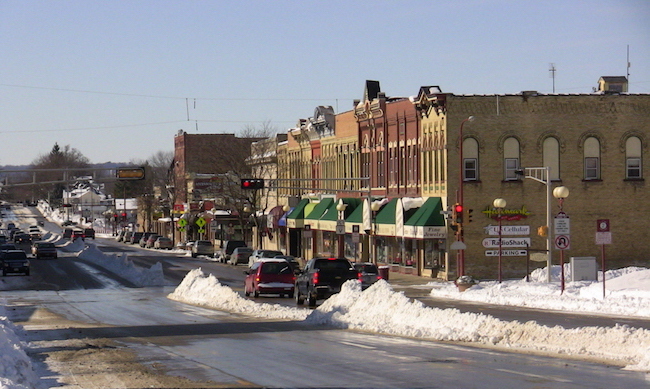 Image of downtown Reedsburg courtesy of Country Time Gazette.